On December 10, 1907, a reported thousand men, many medical students, marched through London defending the practice of surgery on live animals (vivisection). This demonstration ended in Trafalgar Square when the police charged the rioters on horseback, culminating in a street battle of several hours’ duration. 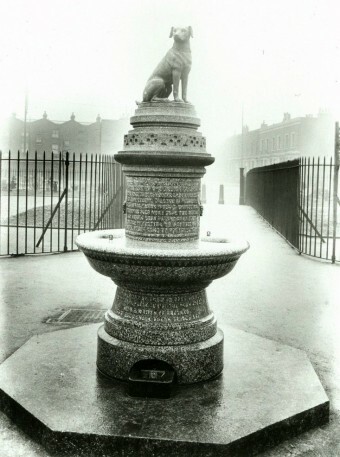 Incredibly, all of this ire was directed at a small statue of a terrier erected in memory of a dog that had died under inhumane circumstances in 1902. The saga began when a small brown terrier was used in an illegal vivisection by physiologists Edward Starling and William Bayliss at University College London. In the presence of 60 medical students, the inadequately anaesthetized animal was cut open, and deprived of the function of its pancreas. Instead of being put down in accordance with the Cruelty to Animals Act, the animal was kept alive, wailing pitifully for weeks until it was used in a further experiment (to prove the results of the first) on February 3, 1903. Dr. Starling cut the dog open again and inspected the results of the previous experiment, a process that took about 45 minutes. The terrier was then brought into the lecture hall and strapped on its back to an operating table. With its legs and head clamped and mouth muzzled, the animal endured another incision as it struggled helplessly against the restraints. The wound was stimulated with electricity in an effort to prove salivary pressure was independent of blood pressure. The experiment was a failure, and a medical student, future Nobel laureate Henry Dale, put the poor dog out of its misery by putting a knife through its heart. Unfortunately for those responsible for this act of cruelty, two animal rights activists from Sweden, Lizzy Lind af Hageby and Leisa Schartau, had enrolled in medical school solely for the purpose of exposing the cruelty of vivisection. When the women exposed the doctors at UCL, they sued for libel claiming they were within the law. They won the court case. This insult to the doctors really got their knickers in a twist. When legal efforts to have the statue removed failed, “anti-doggers” made attempts to destroy it themselves, necessitating 24-hour surveillance to prevent acts of vandalism upon it. Finally, upper-class medical students and doctors were swarming the streets of London with sledgehammers because of a small statue of a little brown dog. Was it really that cut and dried? Probably not, considering the political climate of the time. The anti-vivisection lobby had a high overlap with another controversial special interest political group – the women’s suffrage movement. Of course, not all anti-vivisectionists were suffragists, but medical students used anti-suffrage sentiment to gain support for their crusade against the brown dog statue. In the end, most all of the “anti-dogger” medical students were men, while the majority of the anti-vivisectionists were women. The statue was ultimately removed on March 10, 1910 due to all the controversy and the mounting police costs to protect it from constant attempts to destroy and deface it. Removing the statue in turn gave rise to protests by people wanting the statue put back. But after it was completely destroyed, those protests died down. A new version of the statue was later put up on December 12, 1985, funded by the National Anti-Vivisection Society and the British Union for the Abolition of Vivisection. It was briefly removed in 1992, but relocated to a more secluded location in 1994 in the Woodland Walk of Battersea Park. No idea how it relates to the original site of the statue, but seems more than coincidence that both are in Battersea? If anyone thinks I am mistaken, just a bit of research on the Internet will prove that I am not exaggerating. One can actually view video clips of the crushing of preborn babies’ skulls and the ripping of their limbs from their torsos. Sadly, more than 50% of American adults want at least some abortions to remain decriminalized — because the facts (about the humanity of the babies and they way they are “vivisected”) are hidden from them by the “pro-choice” media. As a result, too many pro-abortion politicians are elected, and there is no end in sight for the killing.